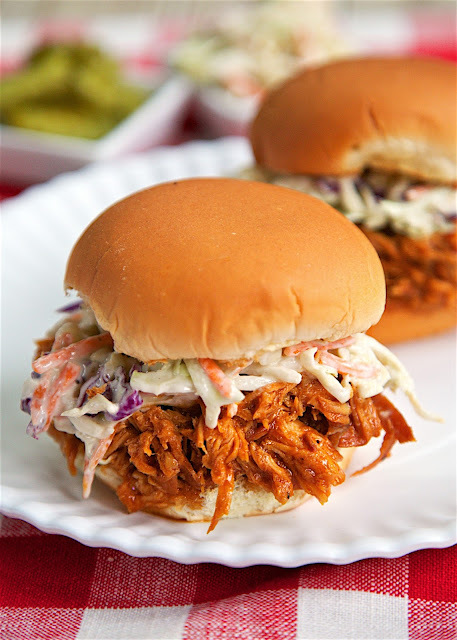 Zesty Slow Cooker BBQ Chicken -only 5 simple ingredients! You probably already have them in the house! Chicken, BBQ sauce, Italian dressing, brown sugar and Worcestershire sauce. I love all of these ingredients and they taste great combined into one easy dish! Feel free to use frozen chicken breasts in this dish. Make a ton, so it's great for a potluck! Serve chicken on buns, nachos, baked potato or on top of a salad. Everyone gobbled this up! I love using my slow cooker during the summer. It is SO hot here in Alabama. It is nice to be able to cook dinner without heating up the house with the oven. This Zesty Slow Cooker BBQ Chicken is a great weeknight meal! Just toss everything in the slow cooker and let it do its thang. 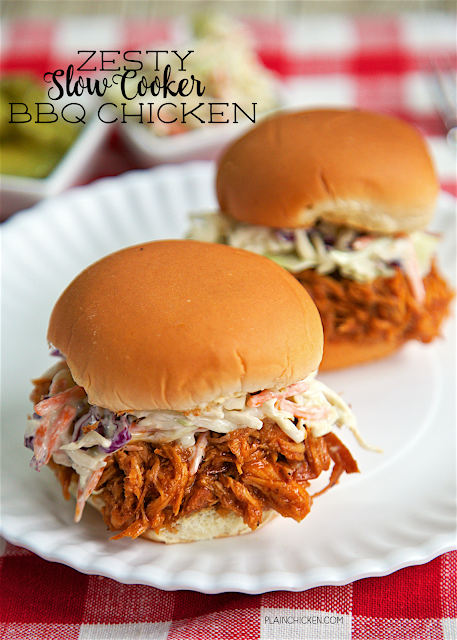 This Zesty Slow Cooker BBQ Chicken only has 5 simple ingredients! You probably already have them in the house! Chicken, BBQ sauce, Italian dressing, brown sugar and Worcestershire sauce. I love all of these ingredients and they taste great combined into one easy dish! Feel free to use frozen chicken breasts in this dish. We served the BBQ Chicken on some slider buns topped with slaw. This makes a ton, so we ate the leftovers on some nachos, a baked potato and on top of a salad later in the week. The leftovers also freeze well for a quick meal later. Place all ingredients in a 6-qt slow cooker. Cover and cook on LOW for 6 to 8 hours. Shred chicken with two forks and stir around in sauce. Serve on top of buns, nachos, a baked potato or a salad. So funny to me to come on here and see this recipe. I've been making this for years and it's what I planned on taking out of the freezer for dinner tonight. I don't add the brown sugar though because to us it's plenty sweet with just the bbq sauce. We love this and make it often! I make it in my dutch oven on top of the stove or in the oven. So easy and it does make alot! I made this last night. It was delicious and I will certainly be making it again! I live in Canada and my bottle of barbecue sauce was not measured in ounces so I measured out a cup and a half. Thank-you so much! I made this last night and i twas delicious! I will definitely be making this again. I live in Canada so my barbecue sauce did not come in a 12-ounce bottle (nor was it measured in ounces at all) so I measured out 1.5 cups. Thank-you for the recipe!